It plays the main role in almost all classic Japanese sweets, the ones collectively called “wagashi” (和菓子) and in most classic Japanese snacks, the ones collectively called “senbei” (せんべい) –most people don’t even understand it is rice because to reach the state called “mochi” (餅) it has gone through a process that has converted it to an elastic dough that can then be kneaded, boiled, roasted or fried, get seasoned with anything –from sugar to soy-sauce, fruit syrup, dried shrimps or seaweed- and served in countless ways. It is at the same time high-class (the nerikiri/煉り切り served during the tea ceremony are small, and often very expensive masterpieces) and pop (the kaki no tane/柿の種mixed with peanuts are the Japanese version of potato chips) and like tofu it manages to define anything that surrounds it without imposing itself. Mochi becomes more noticeable around the end of the year, when in food stores appear the “kagami-mochi” (鏡餅) a pair of thick discs made of it that are put in front of the family altar as a decoration/oblation and are consumed roasted on a grill on the second weekend of January –this is supposed to happen during a ceremony called “kagami-biraki” (鏡開き) meaning “breaking the mochi” or “opening the mirror” (“kagami” means “mirror”) which allegedly originates in Shintoism but in reality it is a tradition that begun during the Edo period and it was first held by the shogun Tokugawa Ietsuna (1641-1680). And like many celebratory events (and not just in Japan) it isn’t but an excuse for fun and drink –besides kagami-mochi, on kagami-biraki the host breaks open a sake cask and guests drink as much as they can take. 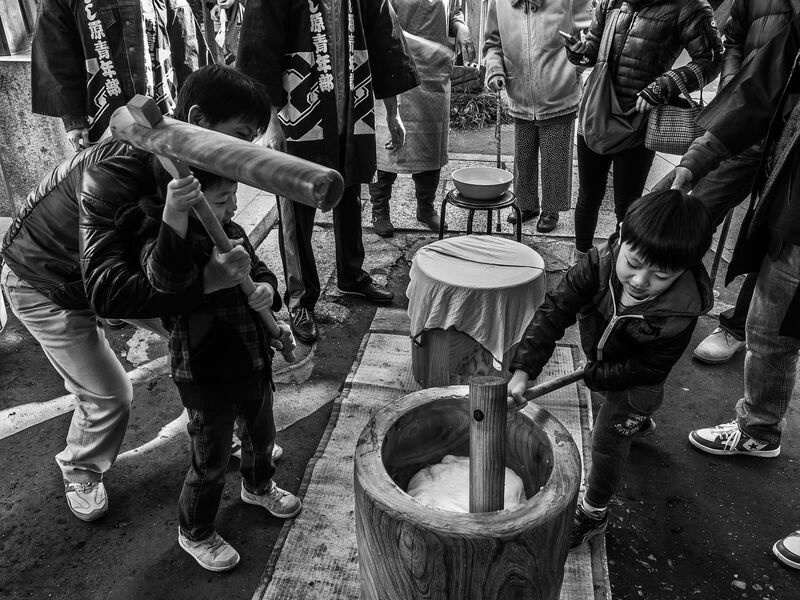 A tradition related to mochi, and one that thankfully is still being kept as a common activity, usually with a temple/shrine as its epicenter, is mochi-tsuki (餅つき/餅搗き) or “pounding of the mochi”: the rice gets boiled and then is transferred to big wooden or stone mortars called “usu” (臼) where the members of the community take turns into pounding it with equally big wooden mallets called “kine” (杵) until it really becomes mochi; then it gets prepared (sweet or savory) and eaten by participants and by anyone that happens to be passing by. To the Japanese the event has a particular significance since, according to folk myths they see on the marks of the full moon a rabbit pounding mochi in an usu; I’m still not sure if they really do see it but this is beside the point. What really matters is that the mochi-tsuki brings people even closer and helps them remember that cooperation is the best way to feel full –in your belly and in your heart.